LocalHost Review 2019: Is LocalHost a Good Hosting? LocalHost is an Argentinian company that provides shared web hosting, streaming VPS, dedicated servers, and mail hosting services as well as web design and 3D animation. LocalHost is an IT company that began its operations in 2002. Over the years, they’ve provided reliable internet services and affordable hosting solutions to SMEs and large enterprises across Argentina. The company owns high-quality equipment and boasts a well-trained support staff. Like most established hosting services, LocalHost provides a range of tools to help you create your website and grow your business online. With their Linux hosting, you get ample storage for 40-500 web-based email accounts, FTP access, and a number of database-driven websites. Monthly traffic is in the range of 40-200 GB. Once you register a domain, you can use it to create personalized emails. Don’t worry about your data; LocalHost carries out daily data backups. I also like the fact that they monitor servers and mitigate DDoS attacks within minutes via the DDoS protection service that guards your website against malicious or targeted attacks. Once your website is up and running, they will help you index the pages on search engines. Suitable for Windows-specific apps, their Windows hosting offers full support for ASP and ASP.NET. Activation takes about two hours, you get a bonus com.ar domain for your web app, a basic search engine listing, and your package includes POP3 and SMTP webmail secured with SSL. Shared hosting has its constraints, but fortunately, LocalHost offers dedicated servers for exclusive use. 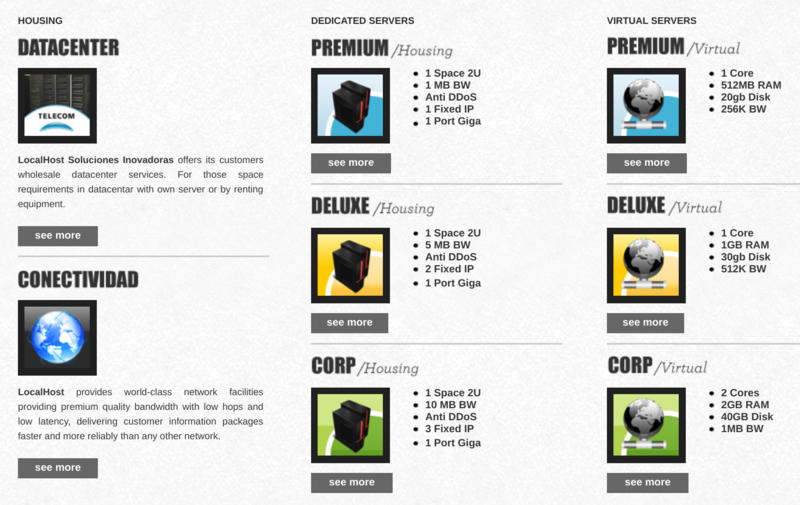 You can order a custom server with the desired bandwidth, CPU cores, and disk storage space. With full root access, their servers let you host video and audio services, or any traffic-heavy websites with multiple IP addresses. You can install software freely and manage your disk space yourself, or have their staff handle the day-to-day operations under their managed service. Onsite technicians monitor servers 24/7 and resolve any issues that could affect the performance of your websites. You shouldn’t have problems managing your account. Using their LocalHost Site Manager, you can create databases, upload websites, configure emails, deploy SSL certificates, and monitor web processes around the clock. Their centralized management panel is accessible remotely from any PC with an internet connection. Though their website is easy to navigate, it’s outdated and not responsive. Despite the tough economic times in Argentina, LocalHost has kept its prices within the reach of ordinary customers. That’s a plus when you consider that the cost of living has risen tremendously while the value of the Peso has plunged. When you order a package, you can pay via check, bank deposit, wire transfer, credit card, or PayPal. LocalHost provides its customers with comprehensive technical support, with 24/7 email access and live operators available via Skype and telephone from 10 am to 5 pm. Their technicians can help you install and configure new apps as well as updating outdated software. To help you manage your web space effectively, they’ll give you access to downloadable technicals guides that cover webmail configuration, FTP access, and website transfer from Dreamweaver. LocalHost caters for personal and business hosting needs via a range of shared Linux and Windows hosting, plus VPS and dedicated servers. Wondering how LocalHost stacks up against other Web Hosting companies? Enter any other Web Hosting company and we will give you a side-by-side comparison.